The GOTS label means that the material itself is certified organic, and that the strictest consideration for the environment has been taken in all other processes such as dyeing, knitting and sewing. GOTS also takes into account the working conditions of those who produce the T-shirts. Did you know that if it only reads "organic cotton" without an attached ecolabel, the dyeing and treatment of the cotton can still be full of harmful chemicals? We use GOTS because we take responsibility for our environment and the people who produce our collections. GOTS is the strictest labelling scheme on the market today, and it also includes social criteria to ensure better working conditions for the people who produce the clothing. 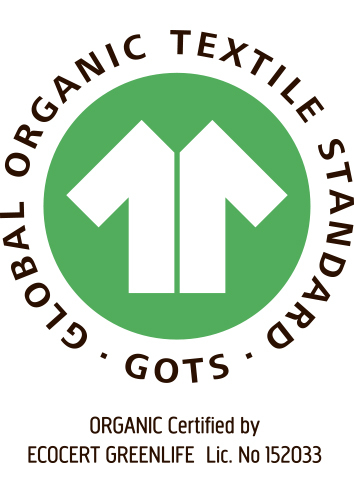 GOTS ensures an environmentally-friendly approach from start to finish, and provides a credible and proven guarantee that you are purchasing the most environmentally-friendly, chemical-free clothing for your children. they care for their children’s and their own health. There are many chemicals in non-certified clothing, and it takes five washes before they are completely eliminated. Eco-labelled clothing also reduces the risk of allergy. are concerned for nature, and about the chemicals we are releasing into it. And it’s not only in the countries where the products are manufactured. When you simply wash the chemicals out in the washing machine, some of them end up in our streams and lakes.